The Pokémon GO phenomenon has mostly faded, but the destruction left in its wake could be far larger than anyone imagined. Two professors from Purdue University have attempted to get an idea of the game’s effect on traffic accidents by studying data from one county in Indiana. The results don’t reflect well on Pikachu and friends. It’s probably unfair to solely blame a free mobile game for an increase in traffic accidents, as users who decided to play an immersive augmented reality game while driving are obviously at fault. But the “Death by Pokémon Go” study from Mara Faccio and John J. McConnell is less about finding an app store bogeyman, and more about gathering specific data related to the rising number of traffic accidents that are believed to be related to “distracted driving.” Beginning in 1988, traffic fatalities seemed to be going down in the US pretty steadily. According statistics from the National Highway Traffic Society Administration (NHTSA), American traffic fatalities numbered 42,130 in 1988, and fell to 29,867 by 2011. Then fatalities and overall crash numbers began to rise again. When the NHTSA saw a 7.2 percent increase in deaths in 2014, it made an official call to action for researchers to study why this is happening. The increase has continued, and in 2016, the number of fatalities hit 37,461. The spread of smartphones has been identified as the primary cause for the increase in traffic accidents over the last several years, but with so many possible contributing factors, it’s hard to name a single culprit. Faccio and McConnell’s study, which has not yet been peer-reviewed, takes a novel approach to gathering related statistics, by cross-referencing traffic accident data from Tippecanoe County, Indiana and comparing it to the counties “Pokéstops.” The authors of the paper hoped to find out if there was any meaningful increase in accidents in areas that are closer to where people are attempting to catch virtual Pokémon while staring at their phones. The two researchers gathered accident data from the county between March 1, 2015, and November 30, 2016. Pokémon GO was released on July 6, 2016, and had racked up over 100 million downloads by the end of that month. 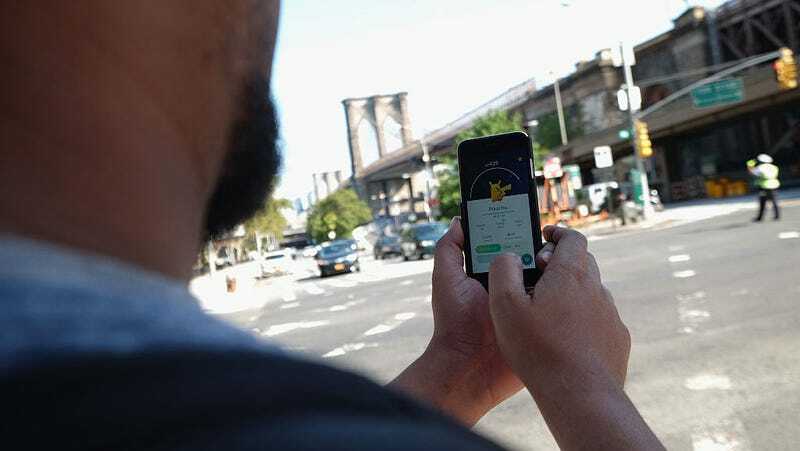 Analysis of the data found that accidents increased across the entire county, but the likelihood of an accident occurring within 100 meters of a Pokéstop was 26.5 percent higher. Numerous factors like school breaks and population fluctuations were taken into account in the researchers model, and each time, the data showed an increase in accidents over the previous year in locations that gained a Pokéstop. All-in-all, the study attributes $500,000 in vehicle damage, 31 additional injuries, and two additional deaths in Tippecanoe County that appear to be related to the Pokémon GO craze. What’s more, the authors write that “the magnitude of the discontinuity drops in the months that follow the introduction of Pokémon GO in a way that is consistent with the drop in the number of active players.” In other words, as people got tired of the game, traffic accidents went down. So, while the usage of smartphones, in general, could be adding to the problem, the study’s case against Pokémon specifically, seems to have some value. When the numbers are statistically scaled up to apply to the entire nation, the results become a lot crazier. The researchers explicitly acknowledge that this data is “speculative,” but they conclude that the nationwide “increase in crashes attributable to the introduction of Pokémon GO is 145,632 with an associated increase in the number of injuries of 29,370 and an associated increase in the number of fatalities of 256,” in just five months. The economic costs come in at a jaw-dropping estimate of “$2 billion to $7.3 billion” over the same period of time. It’ll be up to lawmakers, and other statisticians to determine how seriously this data should be taken, and what should be done about it. Regardless, the study makes a compelling argument that Pokémon GO had a statistically significant effect on traffic accidents. That doesn’t mean that we should ban the game. Its creators have already implemented systems that mostly prevent you from playing while driving these days. But this study could inform policy for using a phone when behind the wheel. It also demonstrates a greater need to analyze the negative financial impacts of technology. As of July, Pokémon GO had pulled in $1.2 billion for its distributors. If these numbers work out to be true, it would seem that the game had a negative economic impact, not to mention the cost of human life. Analyses of tech company’s ripple effects in the economy tend to focus heavily on job creation, and the way governments react to tech tends to be guided by jobs data. Just look at city leader’s scramble to throw tax money at Amazon to convince Jeff Bezos to build a new headquarters in their town. Even if Pokémon can’t be blamed for all that damage, it’s worth remembering that we’re barely scratching the surface of understanding the effects that innovation is having in society right now.